1. Twelve cover slips can be placed in a single rack. We process four racks at a time. 2. We fit two racks in each beaker and use two beakers at a time. 3. Any boiling method can be used; heating in a microwave oven is simply the most practical. 4. Newly eclosed males are the best option, because a dense layer of fat does not yet surround the testis. Larvae and pupae can also be used, but require more expertise. 5. Steps 3 and 4 must be done fast and clean because enzymes released from the digestive tract may damage the spermatocytes. 6. Spreading of the cells is the most critical step of the protocol. Too little spreading will give rise to round spermatocytes that cannot be easily visualized, whereas too much spreading will break the cysts and produce separate spermatocytes with damaged cell surfaces. Dispersed spermatocytes become too flat and deformed, show abnormal spindles, and often fail to divide. We have substituted the traditionally used halocarbon oil Voltalef 10S by a lighter one, Trinity Biotech GmbH heavy mineral oil, which makes manipulation easier. Nevertheless, a considerable amount of practice will be required until the right degree of spreading can be achieved. 7. When cell spreading is properly done, there is a gradient of the different stages along a track that can be easily followed. 8. The following criteria facilitate identification of the best suited cells: (1) Cysts must be as intact as possible so that several cells at similar stages can be found together; (2) do not follow cells that are alone or positioned at one edge, because they are most likely damaged; (3) do not follow cells in which clear signs of cell breakage can be seen (bent spindles, missegregating chromosomes, disorganized membranes, etc.). 9. The cells are not completely flat (under optimal conditions they are approx 8 |im thick), so that phase adjustment might be required from one part to another within the same preparation. 10. Too much light will heat and damage the cells. It is important to reduce the intensity of the light source and the exposure time as much as possible in order to get longer cell survival and, hence, recording time. 11. For fast processes (chromosome movement during early prometaphase or anaphase) images must be taken frequently (at least 20 frames/min), whereas slower processes (centrosome migration during prophase, interkinesis or cytokinesis, morphological modifications, etc.) can be recorded at 2 frames/min (Rebollo and González, unpublished data). 12. NIH software can be set up so that the real time appears in each individual image. This can be reset so that the counting starts from zero. 13. The chromosomes stack up and fail to segregate, the spindles are bent, and cytokinesis fails to proceed. 14. Focusing must be controlled manually, as the cells have no fixed reference point that can be used to set up an auto-focus. Also, the stage will have to be moved to recenter cells that move slightly within the oil. 15. It is convenient to save the images as individual files, naming them with the date and time of the acquisition. In this way, they are saved right after being recorded, not at the end of the session. They can easily be converted to a stack with the Scion Image software. The images must be saved in a format that can be easily processed later. Uncompressed tiff formats are best for these purposes. 16. To process the stacks, a series of macros, some included with the software and others that can be easily programmed, will be required. These macros can be applied to one or two stacks at the same time. 17. The microscope model DM IRBE2 uses a software program to control the objective nosepiece. The program automatically rotates the selected objective into the beam path. Other microscope models require manual rotation of the objective. 18. Instructions to define the beam path are included in the Leica software. We activate the transmission light and the 488-nm wavelength light and record them simultaneously. For long recording sessions, we recommend keeping the intensity of the radiated light at the minimum level necessary to detect the GFP signal. This will allow the spermatocytes to survive longer. 19. The specifications given in this chapter are optimized for (1) long acquisition times, (2) intermediate image resolution, (3) fast scanning speed, (4) reduced number of sections (two to six) per time-point, (5) reduced number of frames (two to four) per image, and (6) very low recording rate (one stack every 1-2 min). Other applications will require different settings, in which cell survival will be compromised to get a faster scanning and a better time resolution of a specific process. 20. This will depend on the software utilized. As explained earlier, the possibility of saving individual images separately in tiff format is the best option for subsequent processing. 21. Any software that can read and convert the saved tiff images into tiff stacks will be useful. We use either Scion Image or IDL software to build the stacks and obtain the desired projections and adjustments. 1. Cooper, K. W. (1965). Normal spermatogenesis in Drosophila, in Biology of Drosophila (Demerec, M., ed. ), Hafner, New York, pp. 1-61. 2. Tates, A. D. (1971). Cytodifferentiation during spermatogenesis in Drosophila melanogaster. An electron microscope study. Ph.D. thesis, Rijkuniversiteit, Leiden. 3. Lifschytz, E. and Hareven, D. (1977). Gene expressions and the control of spermatid morphogenesis in Drosophila melanogaster. Dev. Biol. 58, 276-294. 4. Lifschytz, E. and Meyer, G. F. (1977). Characterisation of male meiotic-sterile mutations in Drosophila melanogaster. The genetic control of meiotic divisions and gametogenesis. Chromosoma 64, 371-392. 5. Lindsley, D. and Tokuyasu, K.T. (1980). 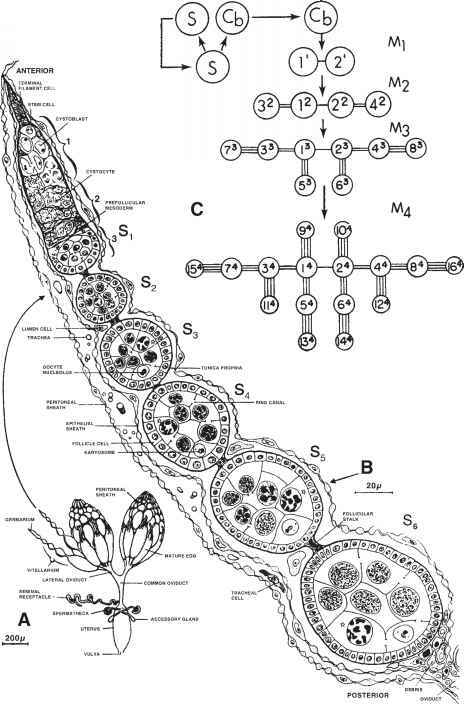 Spermatogenesis, in The Genetics and Biology of Drosophila, Vol. 2b (Ashburner, M. and Wright T. R. F., eds. ), Academic, London, pp. 225-294. 6. Lifschytz, E. (1987). The developmental program of spermiogenesis in Drosophila: a genetic analysis. Int. Rev. Cytol. 109, 211-258. 7. Hackstein, J. H. (1991). Spermatogenesis in Drosophila. A genetic approach to cellular and subcellular differentiation. Eur. J. Cell Biol. 56, 151-169. 8. Castrillon, D. H., Gonczy, P., Alexander, S., et al. (1993). Toward a molecular genetic analysis of spermatogenesis in Drosophila melanogaster: characteriza tion of male-sterile mutants generated by single P element mutagenesis. Genetics 135, 489-505. 9. Fuller, M. (1993). Spermatogenesis, in The Development of Drosophila melano-gaster (Martinez-Arias, A. and Bate, M., eds. ), Cold Spring Harbor Laboratory Press, Plainview, NY, pp. 61-147. 10. Lin, T. Y., Viswanathan, S., Wood, C., Wilson, P. G., Wolf, N., and Fuller, M. T. (1996). Coordinate developmental control of the meiotic cell cycle and spermatid differentiation in Drosophila males. Development 122, 1331-1341. 11. Maines, J. and Wasserman, S. (1998). Regulation and execution of meiosis in Drosophila males. Curr. Topics Dev. Biol. 37, 301-332. 12. Clarkson, M. and Saint, R. (1999). A His2AvDGFP fusion gene complements a lethal His2AvD mutant allele and provides an in vivo marker for Drosophila chromosome behavior. DNA Cell Biol. 18, 457-462. 13. Kemphues, K. J., Raff, E. C., Raff, R. A., and Kaufman, T. C. (1980). Mutation in a testis-specific beta-tubulin in Drosophila: analysis of its effects on meiosis and map location of the gene. Cell 21, 445-451. 14. Gatti, M. and Goldberg, M. L. (1991). Mutations affecting cell division in Drosophila. Methods Cell Biol. 35, 543-586. 15. Cenci, G., Bonaccorsi, S., Pisano, C., Verni, F. and Gatti, M. (1994). Chromatin and microtubule organization during premeiotic, meiotic and early postmeiotic stages of Drosophila melanogaster spermatogenesis. J. Cell Sci. 107, 3521-3534. 16. Church, K. and Lin, H. P. (1985). Kinetochore microtubules and chromosome movement during prometaphase in Drosophila melanogaster spermatocytes studied in life and with the electron microscope. Chromosoma 92, 273-282. 17. Church, K. and Lin, H. P. (1988). Drosophila: a model for the study of aneup-loidy, in Aneuploidy, Part B. Alan R. Liss, Inc., New York, pp. 227-255. 18. Rebollo, E. and Gonzalez, C. (2000). Visualizing the spindle checkpoint in Drosophila spermatocytes. EMBO Rep. 1, 65-70. 19. Savoian, M. S., Goldberg, M. L., and Rieder, C. L. (2000). The rate of poleward chromosome motion is attenuated in Drosophila zw10 and rod mutants. Nature Cell Biol. 2, 948-952. 20. Sampaio, P., Rebollo, E., Varmark, H., Sunkel, C. E., and Gonzalez, C. (2001). Organized microtubule arrays in gamma-tubulin-depleted Drosophila spermatocytes. Curr. Biol. 11, 1788-1793. 21. Lange, B. M. H., Rebollo, E., Herold, A., and González, C. (2002). Cdc37 is essential for chromosome segregation and cytokinesis in higher eukaryotes. EMBO J. 21, 5364-5374. 22. Nicklas, R. B. and Staehly, C. A. (1967). Chromosome micromanipulation. I. The mechanics of chromosome attachment to the spindle. Chromosoma 21, 1-16.